The Malibu is also getting a new face for 2019. And it all works fine. 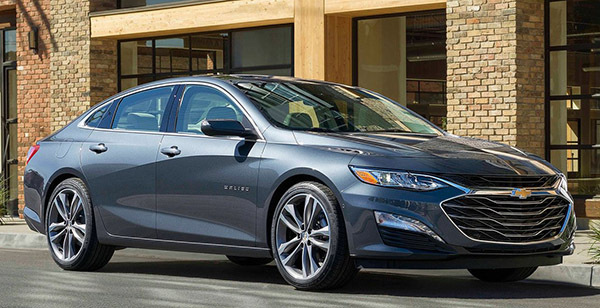 The current Malibu is a really good looking sedan and the changes don't ruin it at all. There is now a sportier looking RS model available for $25 000. All versions are now powered by the 1.5 Turbo engine and CVT. Except the top of the line Premier model with keeps the 2.0 Liter and 9 speed auto. These combos almost match exactly the Honda Accord... At least on paper. Except you can get the 2.0 Liter in more than the top model Accord. This one from this angle looks really nice. Next step would be to get rid of the, oh so 70s, golden emblem on the hood. Is their clientele still wearing golden chains and bell bottoms? Just like Buick needs to take the cheesy colors off theirs. New grill is big and ugly looking! They must of hire a Toyota designer(s). I would totally rent one of these. I drove a 2018 for 1 month. It's a decent car. The biggest issue us the plasticky interior. I will never buy any GM made car, but this looks attractive. Too bad that midsize sedans are a dying segment because Chevrolet has one of the best looking examples on the market. It is a truly gorgeous sedan. I have an LT model as a company car - it's been great! I previously was driving a 2004 Acura TL. The Malibu feels much more nimble, gets great mileage and has proven very easy to live with. Apple Car Play has also been great! I'm not sure I'd buy one with my own money, but it's been a great company car.